The Professional Regulation Commission release the October 2014 Psychologist Licensure Examination along with the Psychometrician Licensure Examination given on the testing centers in the cities of Manila and Lucena. The much awaited licensure exam was successfully held on October 26 - 27 and October 28 - 29, 2014. The Board of Psychology and PRC gave the first schedules for Psychologist and Psychometrician licensure exam for the year 2014. The chairman of the board is Ms Miriam P. Cue and Ms Imelda Virginia Villar as member. In the REPUBLIC ACT No. 10029, Section 2, stated that "The State recognizes that psychologists have an important role in nation-building and development. It also acknowledges the diverse specializations of psychologists and the diverse functions specific to the varied specializations. It particular, it recognizes the significance of the psychological services that practicing psychologists provide to diverse types of clients, but also recognizes the need to protect the public by preventing inexperienced or untrained individuals from offering psychological services. Hence, it shall nurture competent, upright and assiduous psychologists whose standards of practice and service shall be excellent and globally competitive through the administration of inviolable, effective and credible licensure examinations and the imposition and promotion of regulatory measures, programs and activities that enhance their professional growth and well-being." And in the Section 1 of the said R.A., that this "Act shall be known as the 'Philippine Psychology Act of 2009.'" Applicants of the October 2014 Psychology board exam can now keep or bookmark this page for your future references of the official results that soon to be released by PRC. We would like to congratulate all the successful passers of the Psychologist Licensure Examination and Psychometrician Licensure Examination this October 2014. For more Psychology Board Examination related information, Please bookmark this page for updates and you may also share this post to your friends. 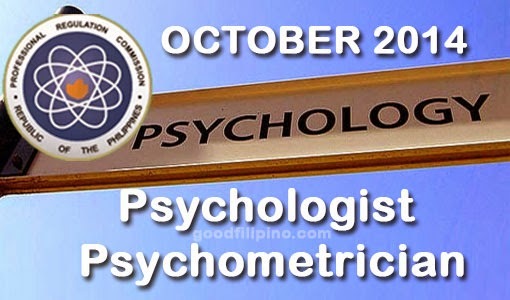 Comments or suggestions about "October 2014 Psychologist Board Exam Results - Psychometrician List of Passers October 2014" is important to us, you may share it by using the comment box below.